Aspen’s EX-Series (Equipment Series) extreme duty trailers are equipment/machinery hauling trailers which primarily serve the construction & logging industries and are capable of both on road and off road applications. 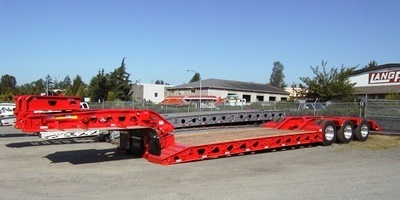 Configurations vary from payloads of 55 tons through 75 ton capacities, with axle configurations ranging from 9 through 11 axles (including truck axles). Aspen EX-Series trailers feature hydraulic removable necks with double drop, square or beaver tails. EX-Series trailers can be configured with a variety of components including various deck widths and lengths including custom options. The EX-Series trailers have common air/regulated air suspensions or a wheeler suspension (16 wheel or 24 wheel air ride suspensions) and can be integrated with a booster when required. Aspen’s EX-Series of trailers are available in specific regional configurations to maximize trailer configurations for specific regional regulations. A common Aspen trailer in this series is the Aspen Ironhorse trailer, specifically designed for the British Columbia market which has severe operating applications. Aspen’s EX-Series was designed from the load down to maximize payload capacity and minimize tare weight. The EX-Series takes advantage of Aspen’s “flex frame” design which allows the frame to flex in all of the right places to allow frame deflection without breaking in key areas of the trailer. Experienced Design … Aspen’s EX-Series is meticulously designed by Aspen engineers with over 240 years of combined trailer engineering knowledge. Not only is engineering knowledge important, but the combination of specific trailer industry experience and mechanical engineering knowledge makes our product one of the best trailer brands in the industry. Premium brand name components … if it’s not designed and built by Aspen, we use only premium brand name components in our trailers so that if you need service or parts for those items that wear out, you can find them just about anywhere you are. 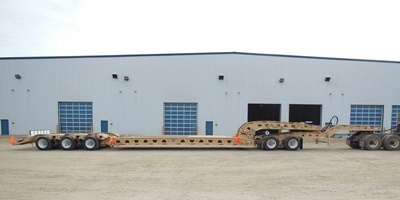 Aspen’s heavy duty/extreme duty designs have been developed with years of knowledge obtained by building trailers that are used in some of the most challenging operating and environmental conditions in North America. 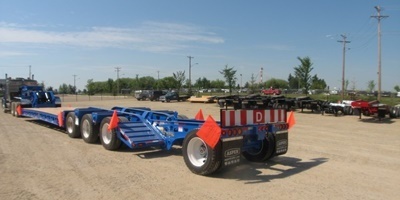 This knowledge makes these trailers suitable for on and off highway use so you don’t have to trans-load onto a heavier trailer or worry about taking the trailer off road into those circumstances that could damage lighter duty trailers. All of Aspen’s self-loading trailer designs make use of low profile loading ramps either over the front or over the beaver tail to make loading your equipment easy and as efficient as can be for more time on the road, and less time loading. Aspen’s heavy duty/extreme duty suspensions are designed specifically to hold up in off road conditions that would damage “lesser duty” trailers. Using either heavy duty purchased components or Aspen’s in house designed and built “wheeler” suspensions, you can be assured that our trailers and their suspensions will hold up under years of extreme duty use.